Also I would like to change the background colour when you open an image in a new tab from white to a darker colour so it is less straining on the eyes and also for the open new tab that displays the recent websites you have been to as seen in the above screenshot...I love the fact that opening images in a new tab are displayed in the center of the tab which is just perfect.I am glad that was done finally! The new tabs button is not being skinned in Firefox v 28.0. 1:Fix all three tab images. 3:Skin the bottom "bar" of the download window by the Clear list and search window if possible..
4:Have the background colour of the new tabs window when the thumbnails page is disabled set to #2b2f32. 5:Fix the page load progress indicator that is located at the bottom of the url bar. 1:Skinned the add-on toolbar ages ago. 2:Changed the background colour of the new tabs page to #2b2f32. 3:Added devtools folder to the aerofox-bundle-4.0.1.5\chrome\win\browser folder and the dev tools load properly. 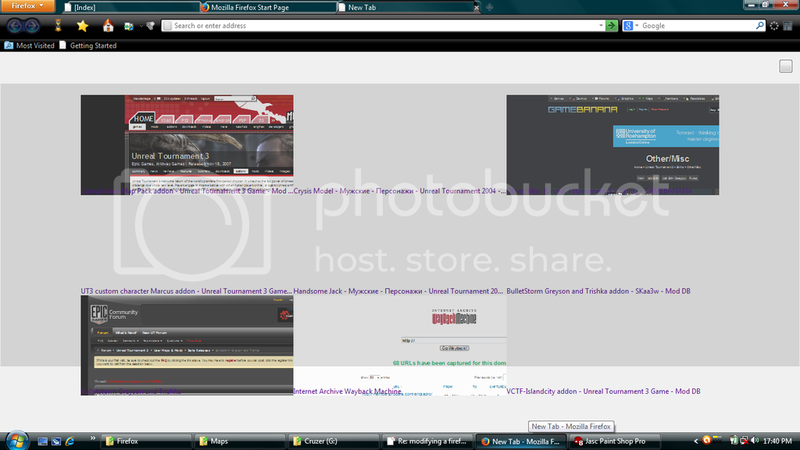 4:Changed background colour to the open image in a new tab from white to #2b2f32. 5:Fixed the add new tab button when you move the cursor over the button and not have the white\grey image 3D button appears as seen in the posted screenshots.The add new tab button has a smallish border but looks better.Managed to remove the border around the add new tab button. 6:Upgraded to Firefox v28.0 and fixed the dev tools plug-ins. Last edited by maxdamage on September 19th, 2015, 7:38 am, edited 5 times in total. I've never really liked the default skin for Firefox but this theme has been the only one I have used and I would like to be able to upgrade Firefox to newer versions with this theme as the "default" one.That is why I need help fixing it up.The author has given up on it and longer will be supporting it so I thought why not fix it myself? Would be very grateful for the support. Anyone? Can the theme be saved and fixed for use in newer versions of Firefox? There's almost nothing in a Firefox 4.0-era theme that will still work in Firefox 37. Also, there were a bunch of major changes in Firefox 29 that means that without a whole heck of a lot of extra work a theme will not work in Firefox 25 and current versions at the same time. Currently, the work-load on keeping themes up-to-date with release versions is so much that most themers have given up and the ones left work at it basically every day. Dark themes especially require a ton of work doing them the traditional way. mcdavis has resorted to using version control software to be able to keep up the pace. There is a "simpler" way of building a theme which still requires a ton of work, but is less fragile to the constant changes. The theme is basically a userChrome hack that sits on top of the default theme. Frank Lion currently uses this method in his themes which you can look at here: viewtopic.php?f=18&t=2821901 (but don't pester him about your work as he probably won't appreciate it). patrickjdempsey wrote: There's almost nothing in a Firefox 4.0-era theme that will still work in Firefox 37. Also, there were a bunch of major changes in Firefox 29 that means that without a whole heck of a lot of extra work a theme will not work in Firefox 25 and current versions at the same time. Currently, the work-load on keeping themes up-to-date with release versions is so much that most themers have given up and the ones left work at it basically every day. Dark themes especially require a ton of work doing them the traditional way. mcdavis has resorted to using version control software to be able to keep up the pace. I understand that and like I mentioned the author gave up on his theme ages ago and I got help from someone else to fix a problem with the addon bar that wasn't skinned and as a result the white background and white text drove me up the wall.Would I be able to still fix the theme for Firefox version up to v28.0 atleast? I have never been crazy about having to upgrade every time a new version of Firefox is released and I "feel" there is minimal changes\adding of code to get the theme fixed for Firefox v25.0 to v28.0 and I feel it is worth it in the long run. 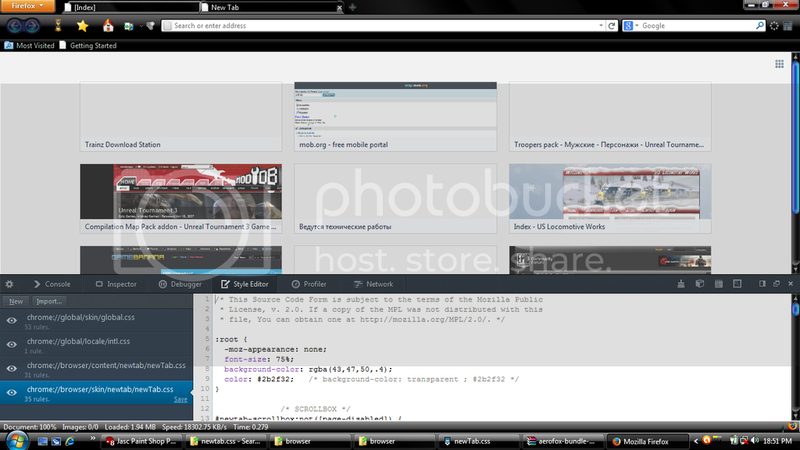 maxdamage wrote: Would I be able to still fix the theme for Firefox version up to v28.0 atleast? How should I know? No-one knows your skill-set and determination other than you. But really, what's the point in doing the ton of work to update to a version that came out a year ago? maxdamage wrote: I have never been crazy about having to upgrade every time a new version of Firefox is released and I "feel" there is minimal changes\adding of code to get the theme fixed for Firefox v25.0 to v28.0 and I feel it is worth it in the long run. There are certainly people who might be willing to help you if you really are willing to jump in and take on the work, but it's not for the faint of heart. You should also consider digging through the dark themes that *are* already available. Firstly the theme was fixed\reworked\upgraded to work with Firefox v4.0.The screenshot I posted in the first post is Firefox v25.0 running the theme.The way I see it is that it looks okay with Firefox v25.0 just some minimal problems which I would love to fix if I can without having to re-build the theme from the bottom up. If you can recommend people who could help me I would be extremely grateful. maxdamage wrote: Firstly the theme was fixed\reworked\upgraded to work with Firefox v4.0.The screenshot I posted in the first post is Firefox v25.0 running the theme.The way I see it is that it looks okay with Firefox v25.0 just some minimal problems which I would love to fix if I can without having to re-build the theme from the bottom up. It may "look" ok but under the hood it will be badly broken. It would be a massive amount of work to make it work with the latest builds just for one persons use. After that, there's 8 more pages to get you up to today. Mozillazine lists 15 comments per page and the average page appears to list over 50 individual bugs, and most bugs represent dozens of lines of code changes. That represents the linear progression from Firefox 4.0 up to today. But there are some areas were entire sections of code were rewritten several times (Devtools have been rebuilt from the ground-up at least half a dozen times) so the only sane way to go about the process is start with the default theme and figure out how to modify it to make that old theme fit. But again, I'd recommend not building a full theme at all and instead use the method that Frank Lion is currently using. But it's probably more instructive to crack open one of Franks themes and look around. I used to maintain several themes specifically for the purpose of having a tutorial for this but I've removed all of my Firefox themes from AMO. malliz wrote: It may "look" ok but under the hood it will be badly broken. It would be a massive amount of work to make it work with the latest builds just for one persons use. Is there a way I can peek under the hood to see the badly broken bits?? An error log or something like that so I know how bad it is? I found the error console.I hope that helps me find what I am looking for or not. Not really. You can use the DOM Inspector to inspect elements to see how they are styled, but there's nothing except your eyes and rigorous testing and trial and error that tells you whether or not something really works. patrickjdempsey wrote: Not really. You can use the DOM Inspector to inspect elements to see how they are styled, but there's nothing except your eyes and rigorous testing and trial and error that tells you whether or not something really works. [16:48:57.433] Could not read chrome manifest 'file:///C:/Program%20Files/Mozilla%20Firefox/chrome.manifest'. [16:49:07.274] Could not read 'file:///C:/Users/Claus/AppData/Roaming/Mozilla/Firefox/Profiles/tff2i3pp.default/extensions/%7Bb9db16a4-6edc-47ec-a1f4-b86292ed211d%7D/components/dhIPreProcessor.xpt'. [16:49:07.275] Could not read 'file:///C:/Users/Claus/AppData/Roaming/Mozilla/Firefox/Profiles/tff2i3pp.default/extensions/%7Bb9db16a4-6edc-47ec-a1f4-b86292ed211d%7D/components/dhIYoutubeTool.xpt'. [16:49:07.275] Could not read 'file:///C:/Users/Claus/AppData/Roaming/Mozilla/Firefox/Profiles/tff2i3pp.default/extensions/%7Bb9db16a4-6edc-47ec-a1f4-b86292ed211d%7D/components/dhIYTHQChecker.xpt'. [16:49:07.311] Could not read 'file:///C:/Users/Claus/AppData/Roaming/Mozilla/Firefox/Profiles/tff2i3pp.default/extensions/%7Bb9db16a4-6edc-47ec-a1f4-b86292ed211d%7D/components/dhIYTHQCheckerListener.xpt'. [16:49:07.386] Could not read 'file:///C:/Users/Claus/AppData/Roaming/Mozilla/Firefox/Profiles/tff2i3pp.default/extensions/%7Bb9db16a4-6edc-47ec-a1f4-b86292ed211d%7D/components/dhIYTLinkFinder.xpt'. [16:49:08.219] Contract ID '@mozilla.org/commandlinehandler/general-startup;1?type=inspector' was registered as a command line handler for entry 'm-inspector', but could not be created. [16:49:21.444] 1429973361444	Services.HealthReport.HealthReporter	WARN	Saved state file does not exist. [16:49:21.444] 1429973361444	Services.HealthReport.HealthReporter	WARN	No prefs data found. Error Console is only going to show you that certain CSS commands have been deprecated or their format has changed. You can just look them up on Google to see the new version... most of them you just have to remove the "-moz-" prefix, others you have to work at to get the correct formatting. But that's mostly for naught as that will NOT tell you whether or not something is actually being applied to an element or not. Again, you need to DOM Inspector and look in a theme designed for a modern version to see the differences. There's also no guarantee that the original theme author used a theme format that even remotely resembles the default theme. patrickjdempsey wrote: Error Console is only going to show you that certain CSS commands have been deprecated or their format has changed. You can just look them up on Google to see the new version... most of them you just have to remove the "-moz-" prefix, others you have to work at to get the correct formatting. But that's mostly for naught as that will NOT tell you whether or not something is actually being applied to an element or not. Again, you need to DOM Inspector and look in a theme designed for a modern version to see the differences. There's also no guarantee that the original theme author used a theme format that even remotely resembles the default theme. I understand that but I can live with it being broken underneath with maybe one or two minor visual errors that you can see in the screenshot of the Firefox v4.0(made for theme) applied to Firefox v25.0.Visually from what I can see is minor elements that are not working\aligned properly like they should be like the text on each tab being "aeroed",the add new tab button not being skinned but if I remove the -moz- from the .css files that might fix them?Fix the tab image but don't know where to find the image in the theme files as I might then be able to fix it? Also the page load indicator that is positioned in the url bar where you enter the web address is slightly mis-aligned which should be able to be fixed but I will post a screenshot of what I mean plus what the dom inspector looks like with the theme and v25.0 of Firefox looks like loaded. The screenshot was taken in Win Vista Home Basic with aero turned on and the theme has aero support.Also I just would like to fix the new tabs background and when opening images in a new tab and change the background to this colour:#2b2f32 so you don't get blinded with the default "white" background. Do have to remove all of the -moz- prefix in al of the .css files for the theme for them to work of do I have to do a search to find which ones I need to keep and ones to remove as that might actually fix some of the visual errors seen in the screenshot?